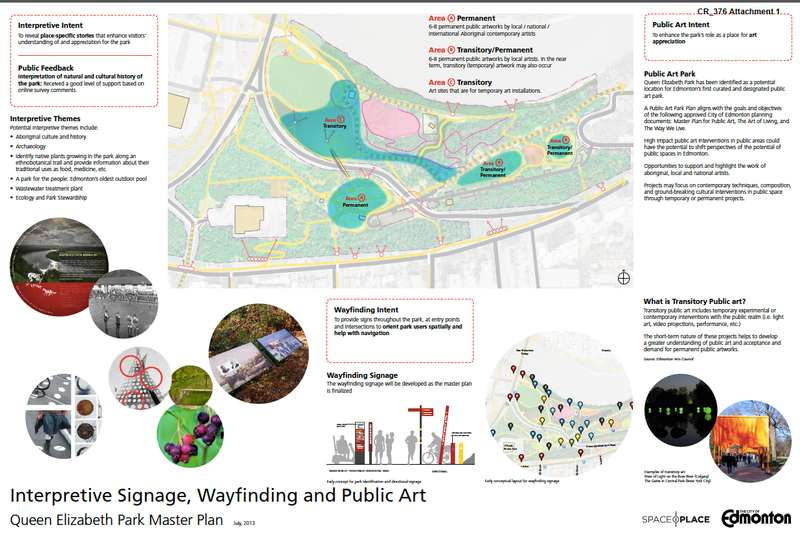 Just a reminder that this Wednesday night the City of Edmonton is holding an 'idea gathering' public workshop for plans being developed for Queen Elizabeth Park. This is an opportunity for you to share their knowledge and thoughts on the future use of the Park. Your input at this workshop is important to help us create a vision for the park that will attract, captivate and delight park visitors now and into the future. We hope that everyone interested in Queen Elizabeth Park will attend this workshop in order to fully participate in the planning process. However, if you wish to be involved but are not able to attend the workshop, an online survey will be available from April 19-May 2 at the project website where you can contribute to the process. Please forward this email to anyone you think might be interested in this process. Last edited by IanO; 17-04-2012 at 08:58 AM. From April 19 to May 2, 2012, you can also complete an online survey. Top of zipline down to rossdale? ^This would be a HUUUUUUGE Canada Day attraction. Especially if the waterfall ever runs again. Could build up a nice tower (for the zipline) right where Queen E Pool used to be. Add in some picnic tables and encourage a food truck or two to park there on weekends. Aside from July 1st that park is always so dead. I like this idea to bring more life to it. Maybe with a few additional touches like a bike lockup, horse-shoe pits, bocce courts, etc. to go along with the grills and picnic tables that are already there. Thoughts on a man-made beach on the Southside of the river down in the Queen E Park 'compound' or whatever? Down on the other side of the hill, close to the new Walterdale Bridge? Doesn't have to actually interact with the water. Just a spot to set up an umbrella/lawn-chair and enjoy the sand/sun/view. Maybe some beach volleyball? Thanks, Ian, I just filled it out. I mentioned your zipline idea in there. The park is pretty unremarkable the way it is now, and I think some kind of attraction would help it out. 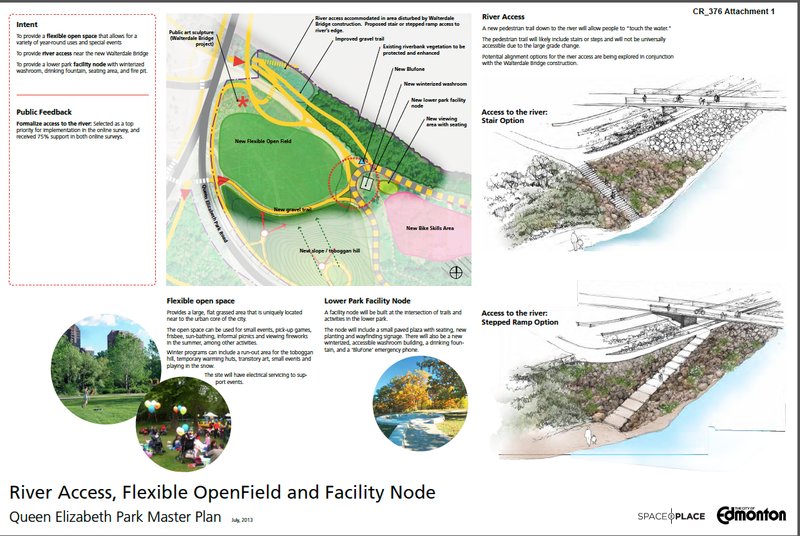 I love the rolling hills of it and the balance between natural and semi natural spaces, but it needs to be developed in conjunction with the new bridge and plan over at rossdale. This entire area could become quite spectacular. As a resident within walking distance of there, I just wish they'd leave QE park as it is. Does anyone know what that O'Keefe building is supposed to be now? Was that was a brewery before? its a storage/maintenance shop for the CoE. I believe they store a bunch of old neon signs here? ^^ Originally Bohemian Maid brewery - later Carling O'Keefe. I saw some construction happening east of the Queen Elizabeth Park Road/Walterdale Road intersection. Is this for Queen Elizabeth Park redevelopment? Walterdale Bridge replacement? or what? Big decisions to be made... Active vs passive riverfront, mountain bike trail etc. Just a reminder that this Wednesday night the City of Edmonton is holding an Open House where the public can drop in to review the draft master plan that has been prepared for Queen Elizabeth Park. This is an opportunity to learn about the proposed design and how public input received throughout the process has been used to shape the plan. 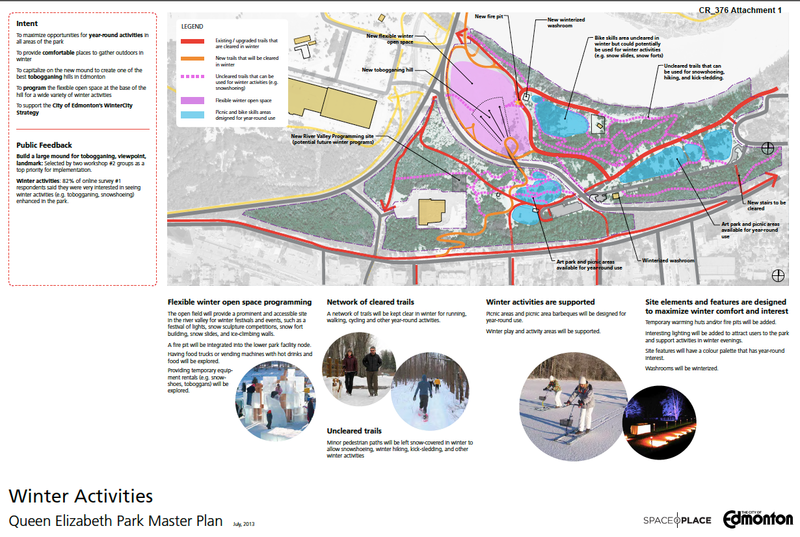 Public feedback from this last round of consultation will help confirm the design direction and determine if any minor revisions are necessary before the plan is presented to City Council for approval in 2013. 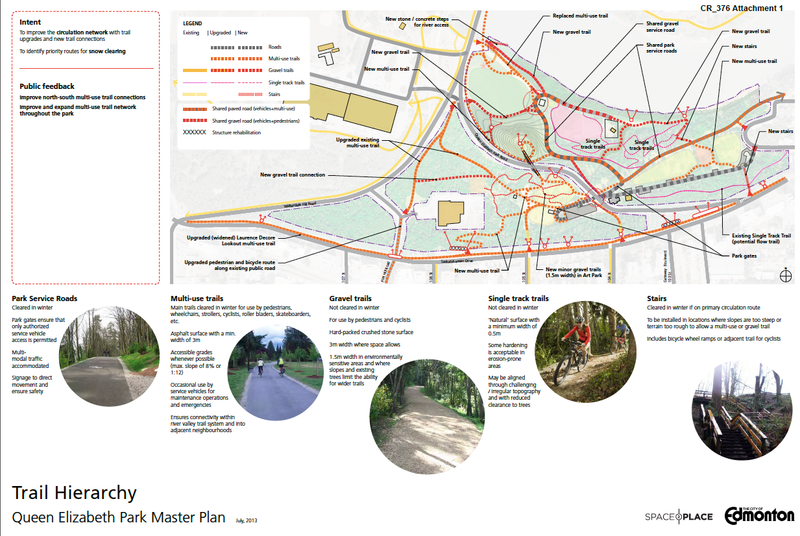 If you are not able to attend in-person then the draft master plan will be available for review on the project website from Thursday, November 15 onwards. An online evaluation will be available November 15-30. We welcome your feedback. For more information please visit edmonton.ca/QEparkplan. Screen shots of www.edmonton.ca PDFs. - awesome! Oh-oh, a grassy knoll. And existing difficult turns. OMG!!!! Seriously - best part to me is the pedestrian OP. Always seemed that unless you lived in Skunk Hollow, car was pretty much the only choice to get to Queen E.
Has anyone looked to Brisbane's river system and services for some more inspiration ? That bike skills park could have been a multi-level no-water-access beach w/ pier or boardwalk. ^how is that sad? A pier or boardwalk on a river with a lot of ice simply doesnt work very well. The proposed location is prominent and incorporating some of the old pump station would be pretty neat. Old pumphouse could have still been incorporated. I just see it as a missed opportunity to effectively put the whole "we need a beach" idea to bed. Two birds with one stone and all. I'd love to see a super long slide down a good portion of the river valley, you'd need a sack to prevent friction burns but it would still be fun. 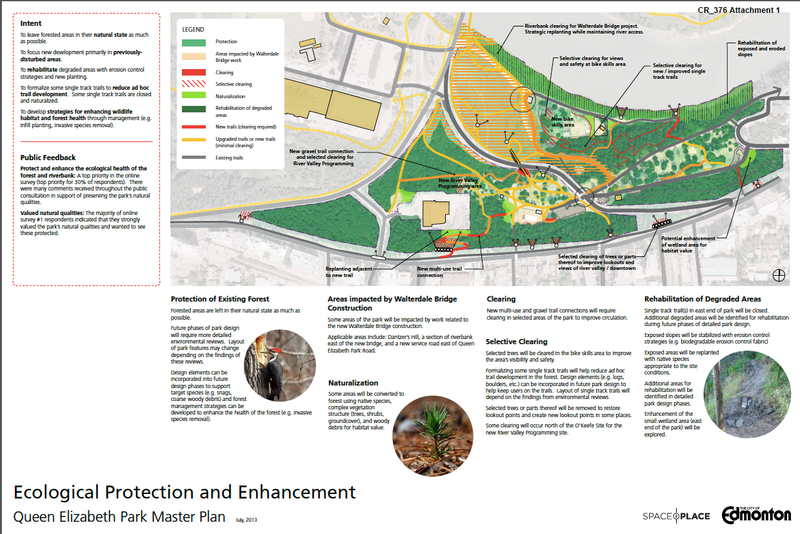 As you are already aware, the City of Edmonton has been developing a master plan to guide the redevelopment of Queen Elizabeth Park. This master plan carefully considers uses in the park throughout all seasons. It offers areas for quiet contemplation as well as active programming, including a bike skills park. 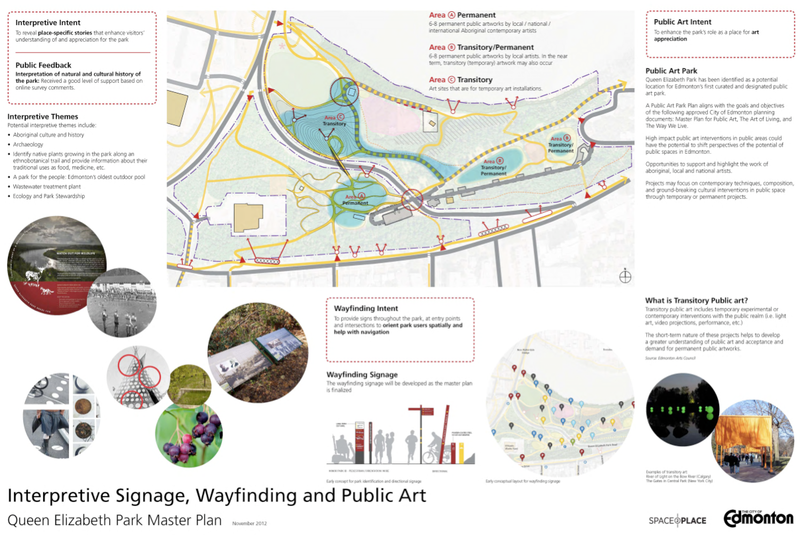 The master plan also recognizes the rich cultural heritage of the area and includes a public art park component, including Canada's first curated art park dedicated to Aboriginal artists. The Queen Elizabeth Park Master Plan report and is now complete and will be available on the project website Friday, August 16th. 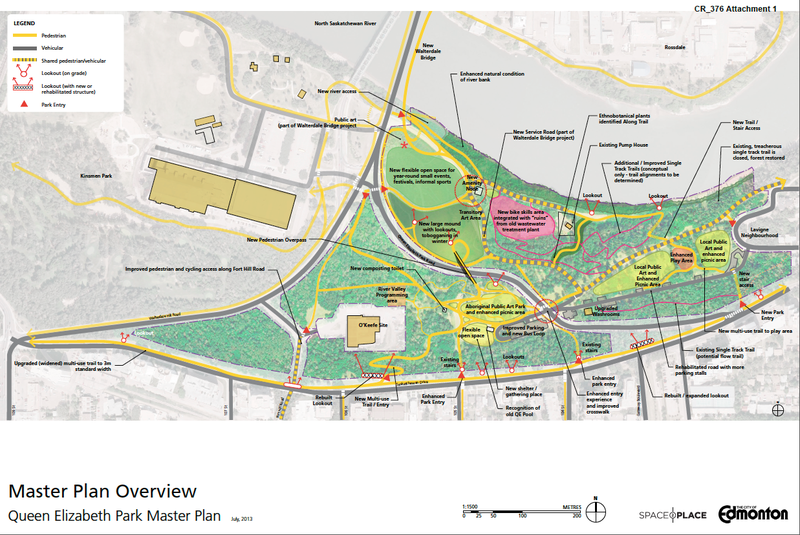 The Queen Elizabeth Park Master Plan will be presented to the Community Services Committee of Council, for approval, on Tuesday, August 20th. A copy of the Council report is available here (Refer Item 6.3). If you want to speak to the master plan then please contact Rhonda Norman (780-944-5642) and she will assist you in registering to speak. 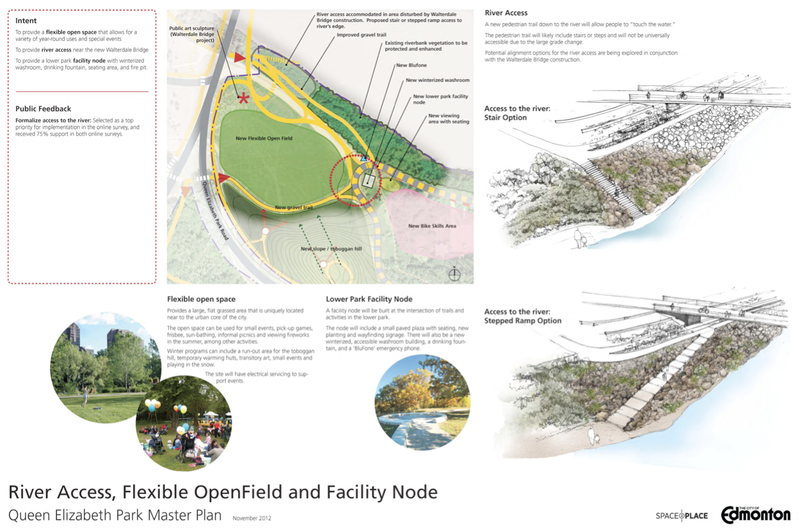 Thank you all for your interest and involvement in the development of the Queen Elizabeth Park Master Plan. We look forward, along with you, to realizing the true potential of this important park in our wonderful river valley. 2013 -$1mil avail to get planning going etc. Remaining $17mil over the next 6 years with completion in 2023. So construction is from 2015-2023 in phases, or that's when budgeting will be complete, and construction will start around 2023? This is a very exciting project. ^construction in the 2015-18 for phase 1, then phase 2 and 3 by the looks of it. Where can we find out what will be built in which phase? I looked through the links supplied, but perhaps I glazed over something too quickly? ^in the report it does not specify what/when really. 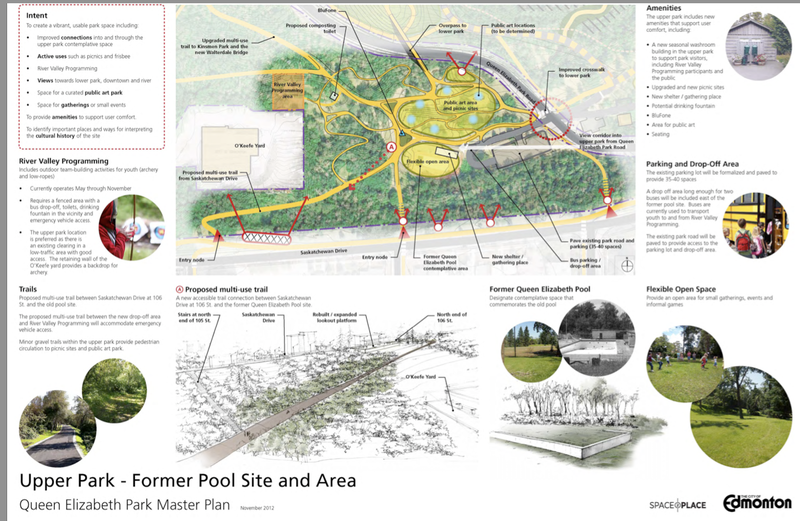 The Queen Elizabeth Park Master Plan was approved by City Council on August 28, 2013. The final document will be available on the project website later this week. The master plan that has been prepared will guide the phased development of the park over the next 10 years. 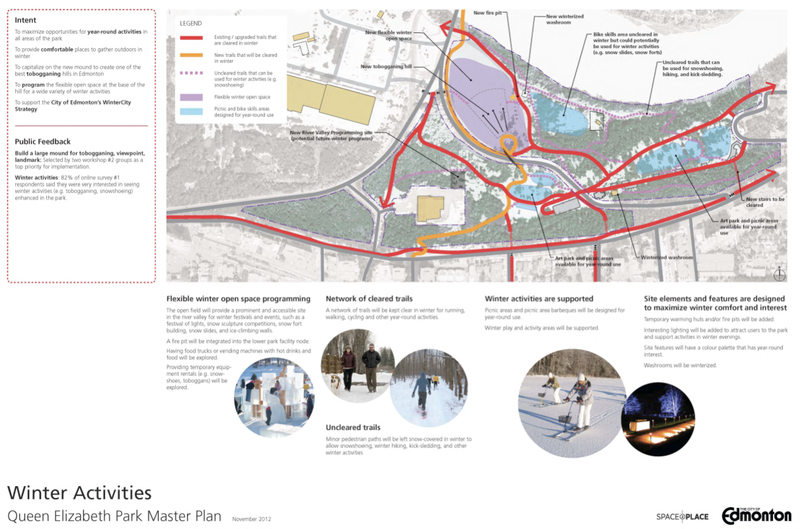 The realization of the master plan can be truly transformative and has immense potential to add to the vibrancy and quality of life in Edmonton. Among the funded projects for the park is an improved crosswalk across Queen Elizabeth Park Road, to be constructed through Fall 2013. 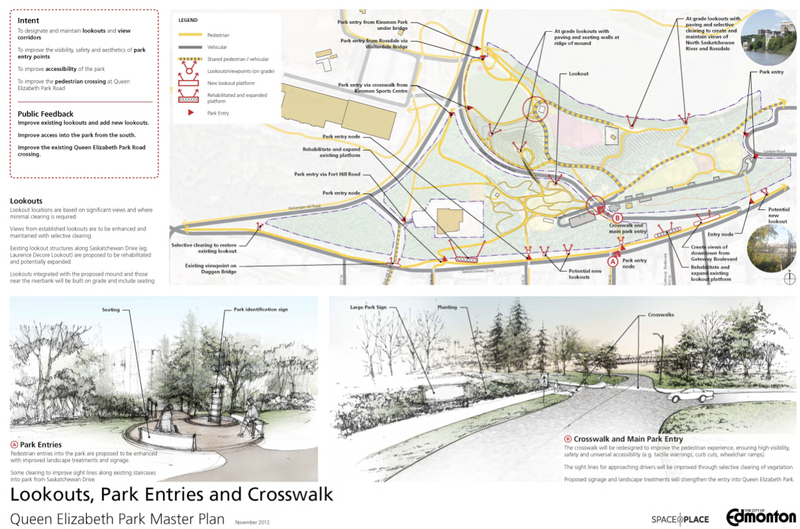 In 2014, the new accessible trail from Saskatchewan Drive down to the improved crosswalk will be constructed and old parking lot areas in the upper park will be naturalized. 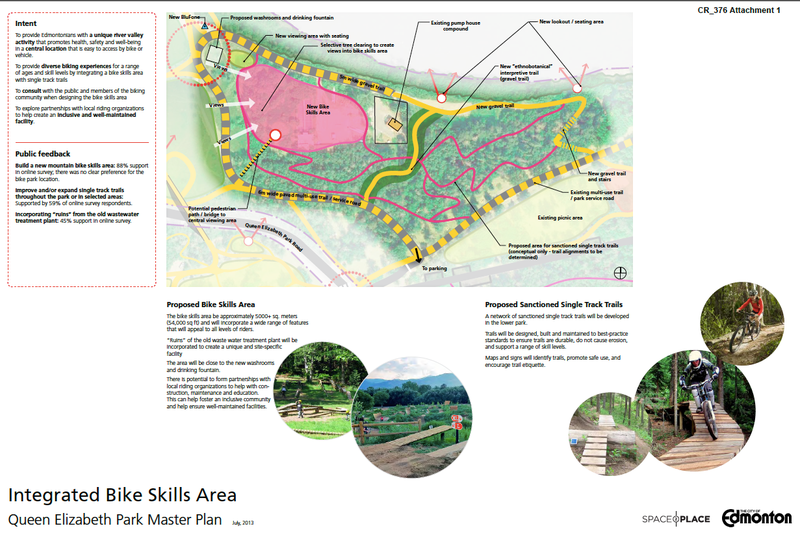 If funding allows then a low wall commemorating the historic significance of the park will also be installed. Funding will be sought in the next four year capital budget cycle (2015-201 to fund the next phase of development. 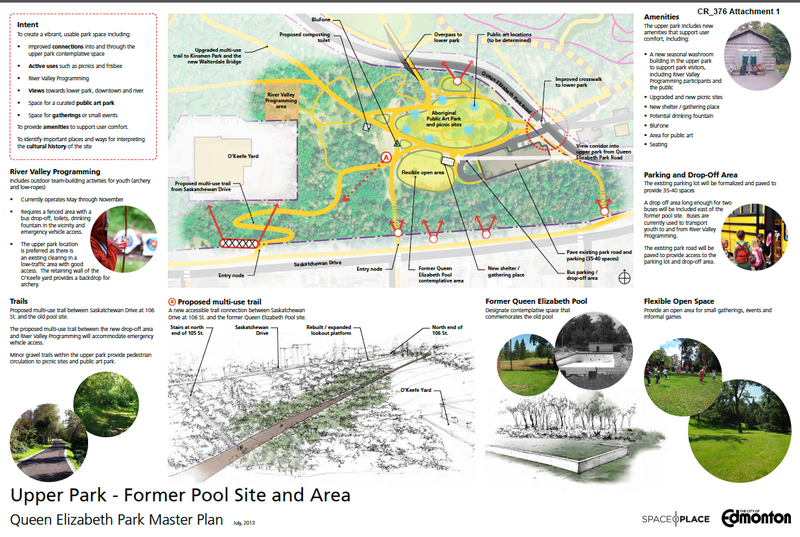 Once again, thank you for interest and involvement in the development of the Queen Elizabeth Park Master Plan. 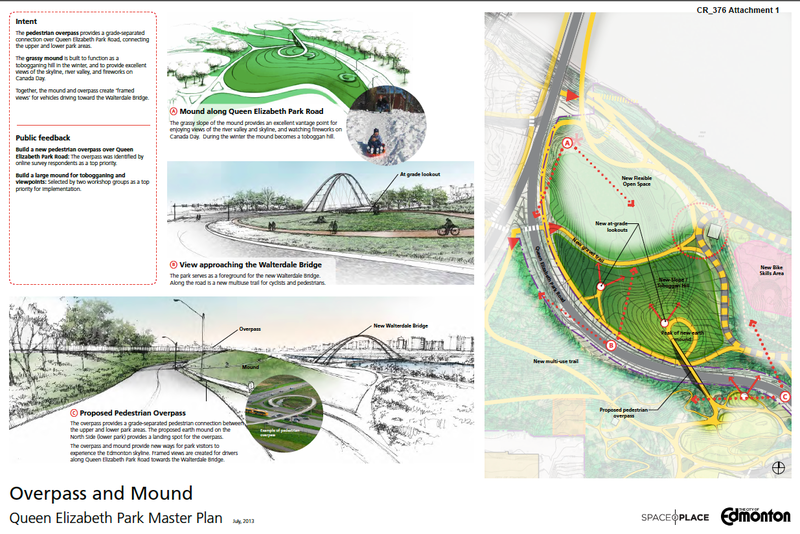 The Edmonton Arts Council and the City of Edmonton will be hosting a Visioning Workshop for the Aboriginal Art Park to be developed in Queen Elizabeth Park. This location lies in the heart of Edmonton's river valley, an area of great cultural and historic significance to Aboriginal people. This art park will be Canada's first curated outdoor art park dedicated to work by Aboriginal artists. Two information sessions will be held next week and you are invited to attend. These information sessions will include a presentation on the history of art parks, background information on the master plan for Queen Elizabeth Park, and information on the Visioning Workshop to be held Saturday, September 28th. A poster for the information sessions is attached for you to post or distribute to anyone who may be interested. For more information on the information sessions or the Visioning Workshop, please contact Dawn Saunders Dahl, Public Art Program Officer, Edmonton Arts Council by phone at 780.424.2787 ext. 229 or by email at [email protected]. ^ link brings me to "River Valley Park System - Wayfinding Signs for Parks & Trails" is that the right link to see the update? This link might be better, I did like the new signs though, the old ones are pretty much worn out. 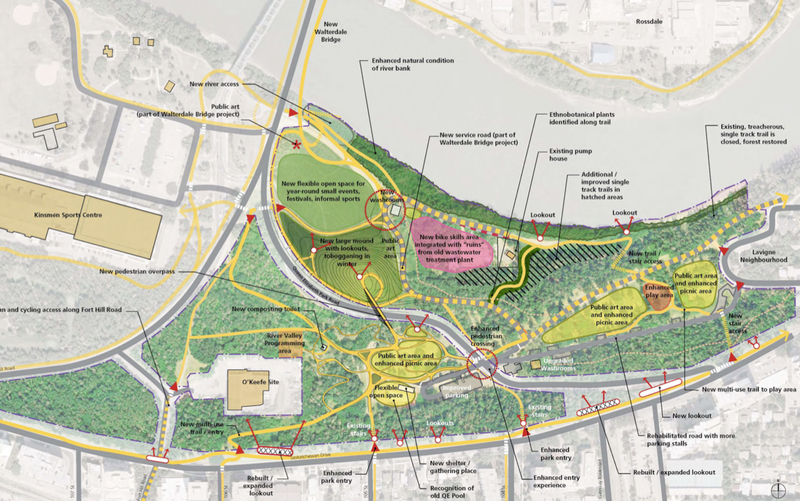 I hope this project moves forward in a timely manner to hopefully entice people to visit this park and be timed with development on the other side of the river to keep people moving in and around the whole area. It's exciting to see the aboriginal arts park moving forward. My antidepressent drug of choice is running. Cheaper with less side effects! Fantastic news, cannot wait to see that entire park to progress. Description:	To contruct and operate a Public Park (construct an outdoor shelter, hardsurfacing parking lot and new pathways, concrete lookout points, new landscaping). Great to see and a nice tie-in to the new bridge. A new asphalt path through Queen Elizabeth Park is already cracking after one Edmonton winter, the city’s audit committee heard Monday. The $1.4-million project is also over budget and running behind after crews discovered the long-abandoned foundations of a brewery in their way. But city officials said the real issue isn’t that a mistake was made. It’s that their project manager thought he would fix it by ordering 17 quality assurance tests for $500 each on a 200-metre stretch of path rather than working with the contractor to make sure the path was correct from the beginning. 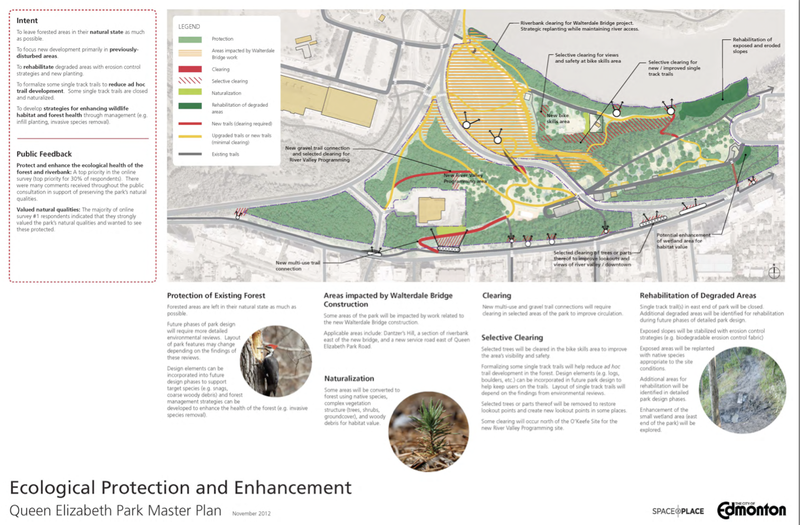 The Queen Elizabeth Park project had challenges from the beginning. The job was given to the lowest bidder, with little assessment of its ability to do the work, because of a clerical error in the tendering process. Left out was the clause requiring companies to be pre-qualified. River Lot 11 the Indigenous Art Park looks like it’s getting close to opening. From QE road you can see a few of the large art pieces and landscaping is motoring along. Looking forward to this opening. I wonder how this win-win concept has been working for them? The job was given to the lowest bidder, with little assessment of its ability to do the work, because of a clerical error in the tendering process. Left out was the clause requiring companies to be pre-qualified. A "clerical error"? How is this not part of standard boilerplate to be _excluded_ as needed? Opens to the public on Sept. 15. It's always refreshing to hear how these project managers respect taxpayer dollars as if it was money coming from their own pocket. Today. In fact, this afternoon.